While Hyderabad is known for biryani and haleem, traditional sweets and desserts are also no less appreciated here. HYDERABAD: While Hyderabad is known for biryani and haleem, traditional sweets and desserts are also no less appreciated here. Apart from the ubiquitous Qubani Ka Meetha, Kaddu Ki Kheer and Double Ka Meetha, a host of other sweets like Jauzi Halwa from the twin cities have started getting some limelight. Badam Ki Jali is another sweet which was comparatively lesser known – but in recent times this almond and cashew based sweet found in the bylanes of Old City is making waves among the discerning food lovers. The baked sweet, which gets its name from the lace like designs on it, has originated from the Navaithas, an Urdu speaking Muslim community in old Madras and Arcot areas. Through inter-marriages the recipe has been adopted in Hyderabad about a century ago, and especially found popularity at wedding dinners. Prepared from ground almond and sugar the jali comes in different shapes and sizes depending on the mould used. Sometimes cashew is also used as an ingredient and silver varq is added for a nice look. 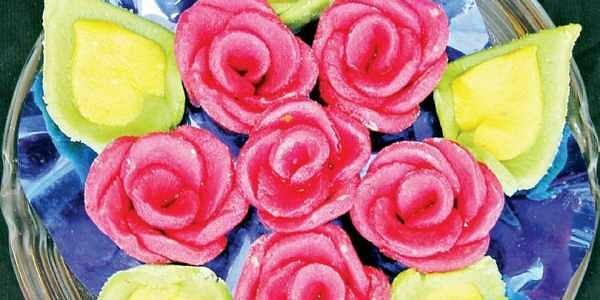 The sweet is presented in different and attractive designs, such as stars, flowers, betel leaves and even fruits. A variant is the ashrafi where the dough is pressed between two Nizami coins, to get the traditional Nizami inscriptions on the round golden coloured sweet resembling a gold coin. Badam ki Jali can be procured only from a few places in the old city. The recipe differs a bit from place to place and is a closely guarded secret. However, the basic process is the same – almonds or cashews are first ground into flour and made into a dough with sugar, and then rolled into a large roti-like shape. Moulds are then used to create the various shapes in which the sweet is available. Next these are baked for some time to give it the finish. Badam Ki Jali tastes very different from other almond or cashew based sweets – it is harder and more delicate. The soft Ashrafi is of a different texture altogether, which unlike the Badam Ki Jali are not baked. While there are a few home chefs who supply these sweets for weddings, Badam Kaju ki Jali is a home-based outlet near Darulshifa which is exclusively making Badam Ki Jali and Ashrafi. Nasreen Hussaini, who runs this place says that the recipe has been passed on through generations and she learnt it from her mother-in-law. While earlier they used to supply only for weddings, they went into retailing a few years back, and now even offer a sugar-free version of the sweet. Hameedi Confectioners at Nampally, who are known more for their Jauzi Halwa, and Almond House are some other places where this sweet is available. One can also get the sweet delivered at home through Snackisq, an online ordering portal.